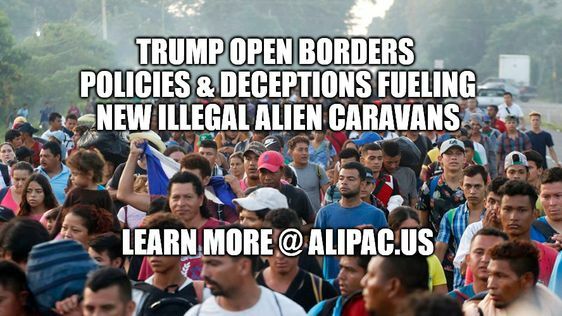 As multiple new caravans of illegal alien fraudulent asylum seekers move towards America's southern border assisted by Mexico, ALIPAC is releasing a report titled, "Trump Lets Caravan Illegals Into USA Inspiring More Caravans to Form," which explains how President Trump's open borders policies and deceptive claims are inspiring and fueling the caravans. "We know from prior Trump deployment of troops to our border that any soldiers sent to the border are under specific instructions not to engage, detain, or stop any illegal immigrants as Trump deceptively wants Americans to believe," explained William Gheen, President of ALIPAC. "While it is true Trump wants to stop large caravans from entering as a group and putting his open borders policies and hypocrisy on full display; Trump is allowing most of these illegal alien caravan members into the USA in small groups of around 100 per day. These latest caravans are coming because Trump let the earlier caravans in, and those illegal immigrants are calling people back home reporting their food, housing, transportation, cell phones, healthcare, and education are being paid for by American taxpayers and consumers. These open borders policies and deceptions by Trump will bring in more illegals in the future." ALIPAC has released a short report to help American citizens and Trump supporters understand how President Trump is misleading the public and allowing illegals into America. For more information or to schedule interviews, please visit www.ALIPAC.us. Last edited by ALIPAC; 02-01-2019 at 01:41 PM. stoptheinvaders and Americandrum like this. Last edited by ALIPAC; 02-01-2019 at 01:40 PM.